After installing the app, there are few things that you should know before using Viralstyle Fulfillment. Be sure to add your payment method to the app, this is required before Launch & Import. You can update your payment method by clicking Settings > Payment Method, then adding a credit/debit or PayPal account with billing agreement. Note: you can set up a billing agreement with the PayPal team if you haven't already. Billing agreements allow 3rd party vendors to withdraw funds from your PayPal account, for production & shipping costs ONLY. There are no monthly fees or charges when using the Viralstyle Fulfillment app on Shopify. 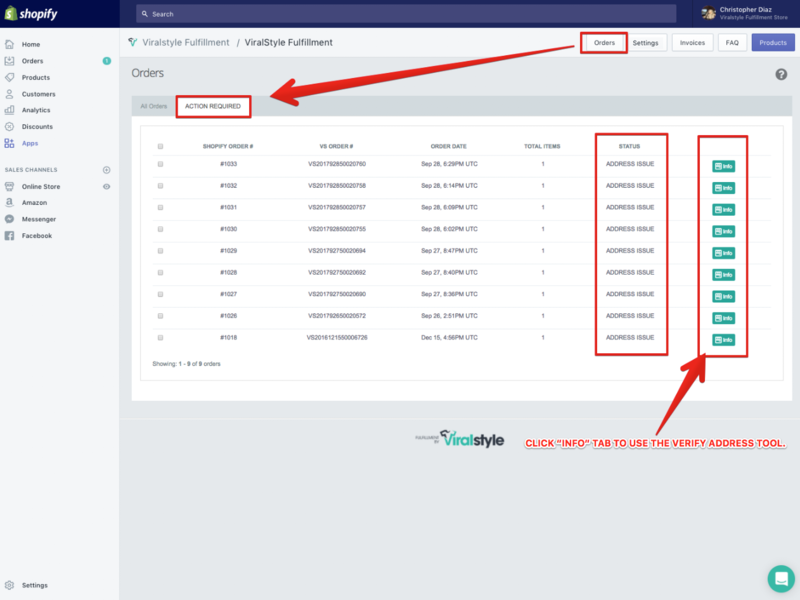 Once the order is placed by your customer, Viralstyle Fulfillment will process and invoice your account for production & shipping costs within 24hrs (using the payment method you've added above). Viralstyle Fulfillment does not process transactions between you & your customers on Shopify. 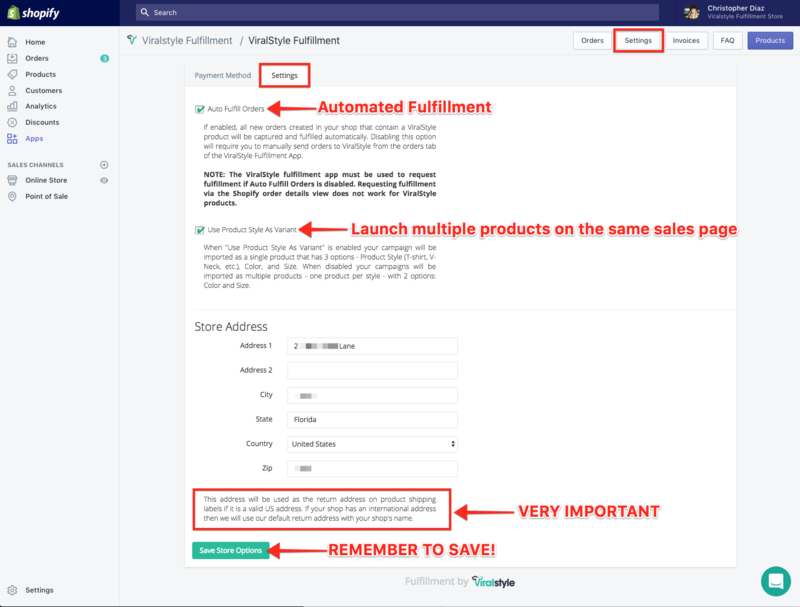 Fulfillment will be automated (by default) from time the order is placed, up to the point of delivery. See the "Settings" tab, on the Settings page below. Viralstyle Fulfillment will update Shopify with the orders status, then Shopify will send the email from your store to notify (which looks like you've sent it out). These settings can be adjusted in your Shopify account. See the two Shopify Help Center articles below. 1.) When the order is confirmed & has reached the Viralstyle Fulfillment queue. 2.) When the tracking number is added to the Shopify Order Timeline, the customer will receive an email with tracking info (if your settings are in order). 3.) When the package is delivered to its destination, the customer will receive an email stating the package is “Delivered” (if your settings are in order). There will be times where orders require manual action before we can proceed. You will need to check your "Action Required" tab as often as you can, seen in the image below. If there is an address or payment issue you'll need to take manual action before we can proceed. The "INFO" tab (seen above) has a 3rd party address tool that will allow you to identify the address issue. 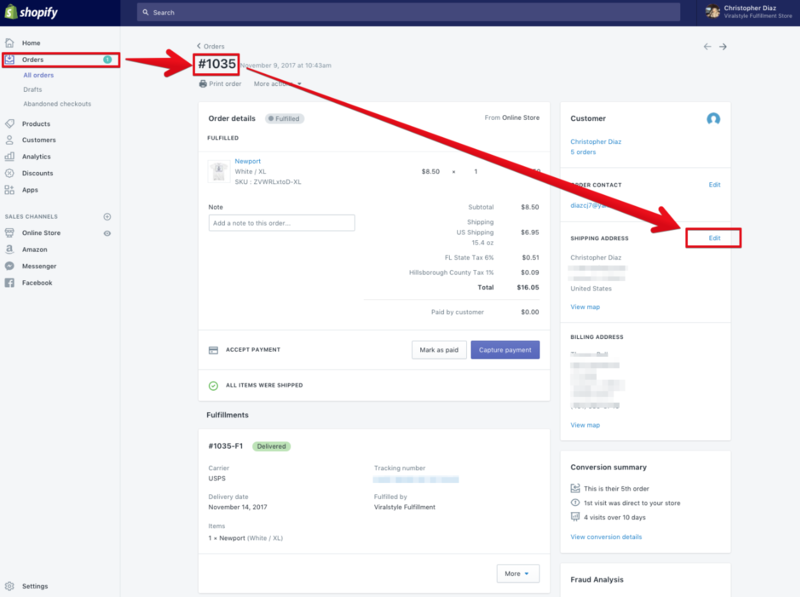 You can then reach out to the customer to request an update (or alternate address), then edit the address on your Shopify order page, seen in the image below. Once you have updated the address(es) we will change the status to "Payment Issue" to inform you that we have not yet approved/verified the address (therefore haven't charged you). Once we have approved/verified the address & charged your payment on file for Production & Shipping costs, the status will immediately change. The order will move back into the "All Orders" tab automatically. This will confirm that we have accepted the new/updated address & will continue with production immediately. If there is a payment issue, you can update your payment method the same way you had added payment after installation. 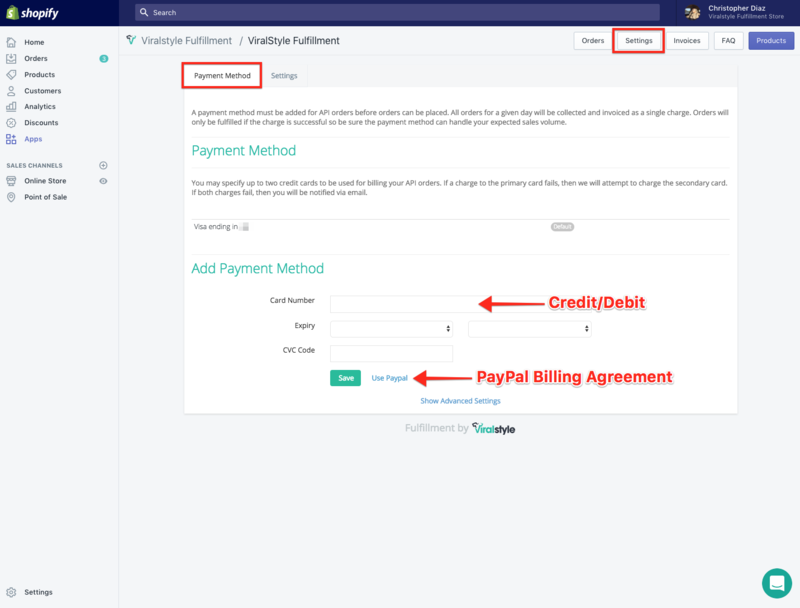 Click Settings > Payment Method, then adding a credit/debit or PayPal account with billing agreement. Once the address/payment update has been made, we will automatically pull the information through to our app. If the address/payment update has been approved, we'll immediately continue with production.